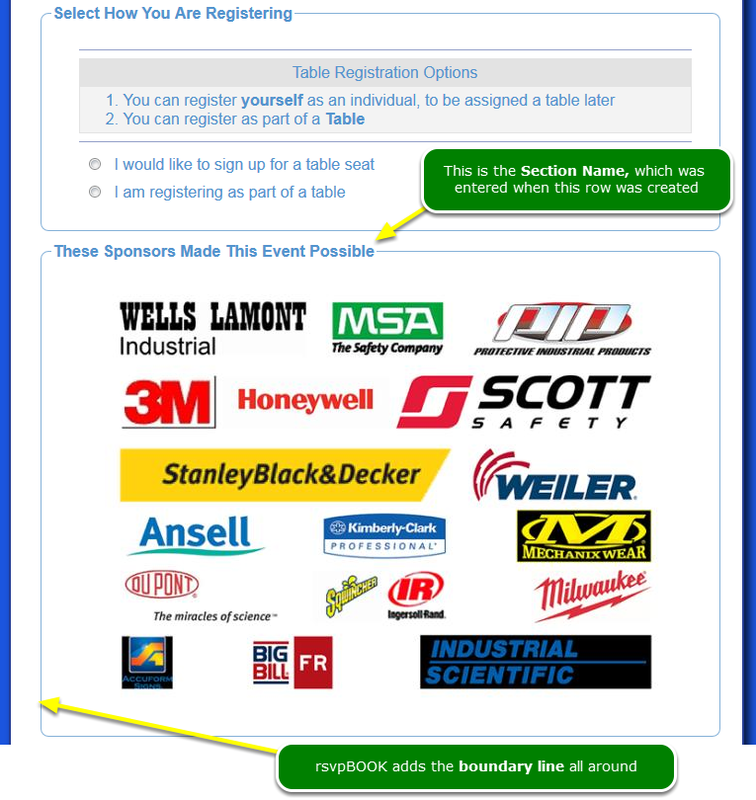 Help Documents - Version 5 Event Revenue StreamsHow do I add Sponsor Logos to my event pages? 1. Create the sponsor logos graphics file. When you ask a sponsor for their logo, ask for the "highest resolution you have, in .jpg or .png format." You will receive all sizes and file types. Therefore, you must assemble all of the logos into one image. Below is an example of a 1-graphic collection of logos. Note that they are of uniform size and spacing. You will need a single graphic containing only logos. The "Thank You ..." label and the Blue box will be added by the system when you upload the graphic. 2. 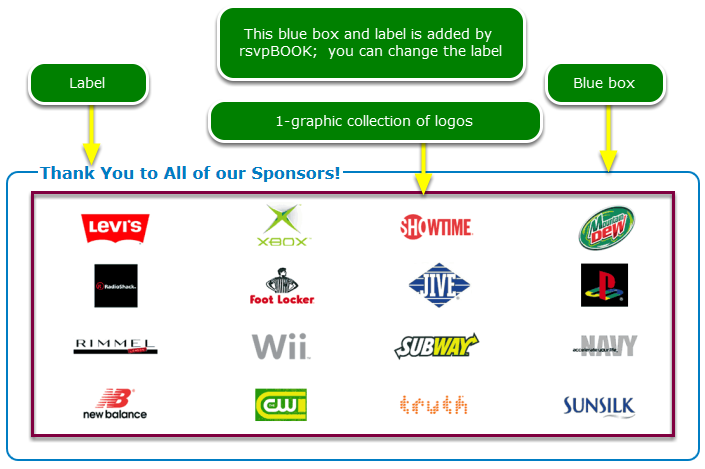 Decide where you want to place the Sponsor block. 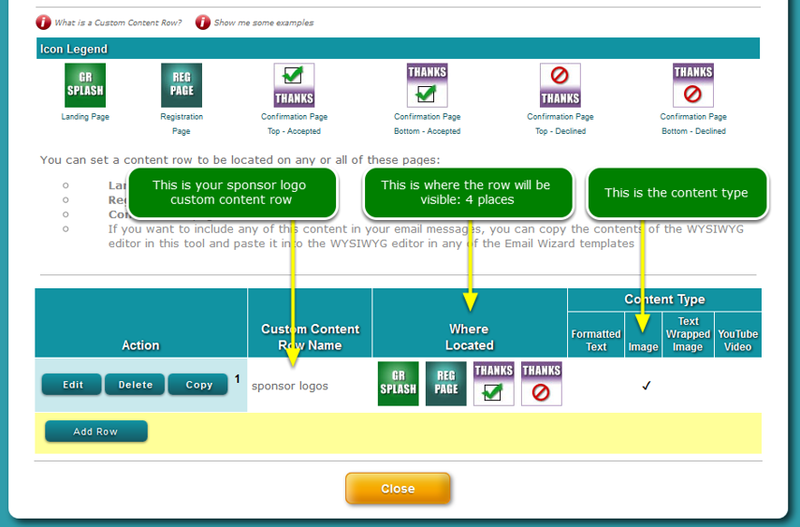 Confirmation email message - see this article: How do I add sponsor logos to email messages? 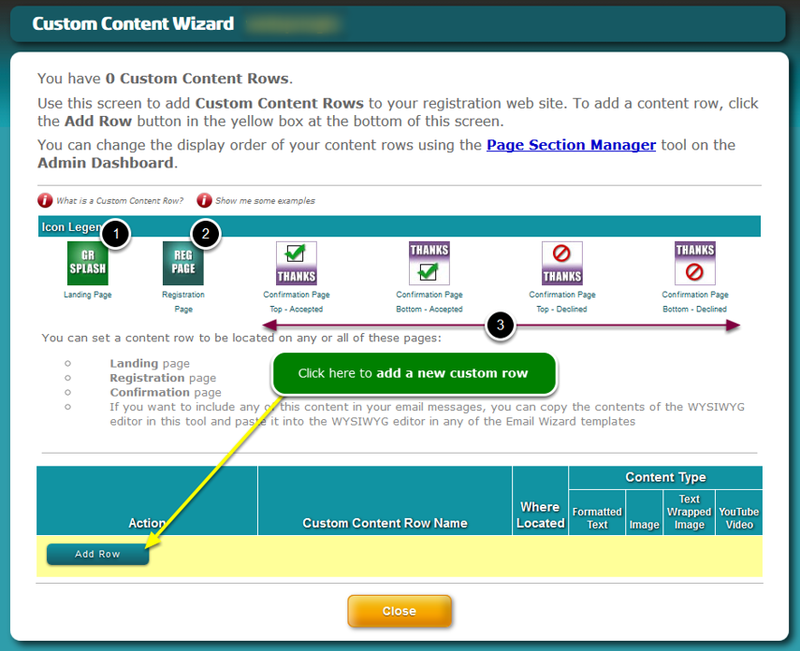 Where is the Custom Content Wizard? If you want to include any of this content in your email messages, see this article: How do I add sponsor logos to email messages? To add a custom row, click the Add Row button in the yellow row below. 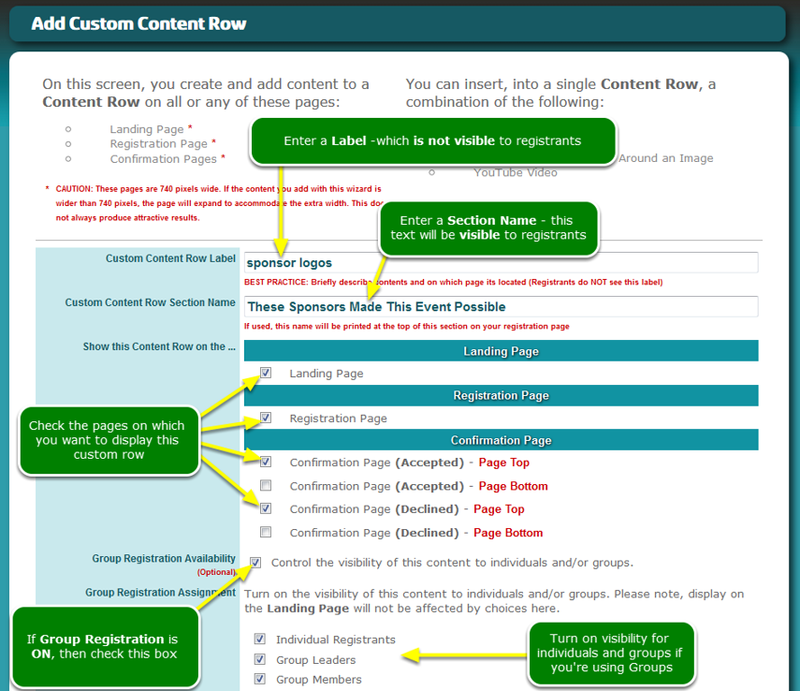 There are no limits to the number of custom rows you can create. 4.1. The editor window opens ... you will build your row on this screen. This screenshot is the TOP half of the page. The next section contains a screenshot of the BOTTOM half of this page. Zoom: The editor window opens ... you will build your row on this screen. 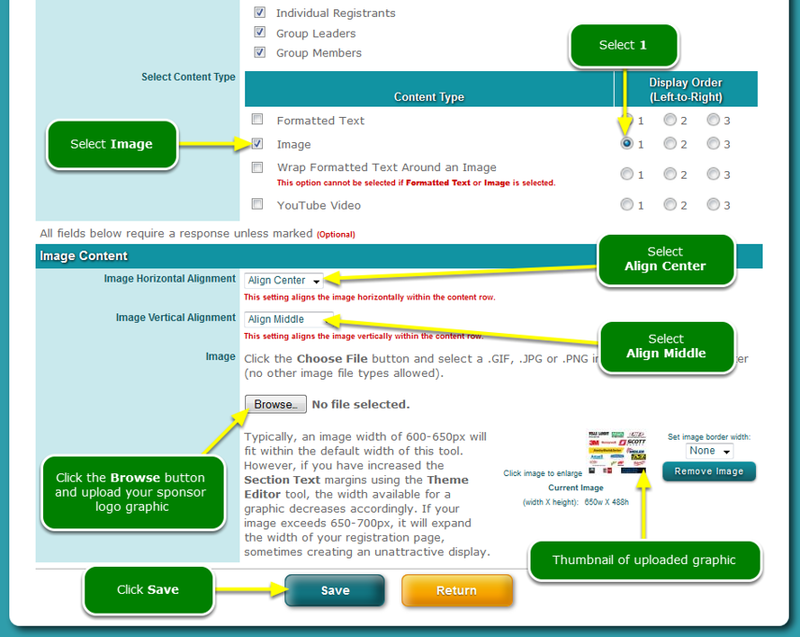 Your new row is listed and can be edited, deleted and copied. You can add as many custom rows as you need; no limits. This is what it looks like on the Landing Page. Other places, where visible, will be identical in appearance. Prev: How do I set up Lead Retrieval options? Next: How do I set up Raffle items?